Planning a do it yourself move? If so, you’re not alone! Lots of people DIY their moves each year, and yours is likely to be in great company. Be advised, though, that a DIY move is a large undertaking, and that doing it the successful way requires some advance planning and implementation. To help we came up with some great DIY Moving Hacks. Once you shut and lock your cube, your items are never touched again until they arrive at your home. Not only does this provide the security and peace of mind you need to enjoy your move, but it also helps ensure that your items stay safe and undisturbed until they arrive at your new house. This is not a benefit that was present in old-style moving, and it’s very unique to the “new” method of moving. Once your cube has been professionally packed, we’ll load it onto our secure trucks using our forklifts. This saves you the time and hassle associated with trying to move a heavy cube on your own, and gets the moving process started more quickly than it would have been otherwise. Professional movers are great at ensuring your items stay safe and secure during transit. One problem they solve, directly, is that of your items staying right-side-up during transit. In the old way of moving, items frequently tipped or fell over during transit, creating a big disaster that resulted in broken keepsakes and hard to clean-up messes. Luckily, those days are gone. With MoveitCubeit, your items stay right-side-up during transit and are virtually guaranteed to arrive in one piece. When you work with MoveitCubeit, professional movers pack your moving cube for you. Not only is this faster than it would be to pack it for yourself, but it’s also much more efficient. Since professional movers understand the ins and outs of moving, they’re better equipped to ensure your pod is packed tightly and securely, and that your items will remain in one safe piece during transit. The last tip for a DIY move is this: consider hiring professional movers to help you with fragile or very heavy items. Even if you think you can move your grandmother’s 1700s piano, it might be wise to call in the professionals for such sentimental and high-value items. Even if you don’t intend to use a team of movers, you’re going to need help during your big move. This is a great place to bring in the troop and ask your friends and family members to help you get the job done. The more hands you have on deck, the faster the process will go for you. Instead of taking all your clothing off your hangers, use a large trash bag to contain it all, on its various hangers. Open the trash bag and bring it up beneath your hanging clothes. When you get to the top, cinch the trash bag just below the “hook” of the hanger. From there, stack these trash bags horizontally in your cube. Cut down on the number of boxes you have to move by packing all your available suitcases, baskets, laundry bins, and anything else that even vaguely resembles a box. This allows you to kill two birds with one stone and makes your move faster and easier. Books are heavy, and they have the potential to blow out standard boxes. As such, it’s important to come up with an alternate carrying solution. Beer boxes work well, since they’re designed to carry heavy bottles, and have handles on the side. A local liquor store should have plenty on hand. Before you start your DIY move, pack an overnight bag that contains all your essentials. You’ll want to add a spare change of clothes, your toiletries, any medications you need to take, some snacks, and anything else you think you might need to be comfortable for a 24-hour period when all your belongings are in boxes. While most people skip over this step, doing it is a guaranteed way to make your move much more streamlined and simple – not to mention comfortable. Want to save money on moving supplies while also cutting down on how many boxes you have to schlep from one place to another? Pack your breakable items, like dinner plates and cups, in t-shirts and other soft clothing. Not only does this save on bubble wrap, but it also helps keep your items safe and break-free during their big trip. Don’t forget to pad out any empty spaces in these boxes with small items like socks. Doing this minimizes movement in the box and helps your items stay safe and secure. As you pack your boxes, be sure you’re adding detailed labels. Each box should get a label that describes what’s inside the box and where it’s supposed to go. If you feel like getting extra organized, add an itemized list to the outside of each box. This allows you to identify exactly what’s inside of your boxes and where they need to go. If you can, go to your new home before you move in and get the kitchen and bathroom ready. Put some clean towels in the bathroom, stock some toilet paper and hand towels, and then head to the kitchen and add a few dinner items to the refrigerator. It’s a simple step, but a big one that will make a big difference in the overall comfort of your move. During a DIY move, one of the most common issues people face is broken dishware. Luckily, you can avoid this by packing plates vertically. Wrap each plate you own in a t-shirt or some bubble wrap, and then place it, on edge, into a large box. Pack all your plates this way and pad them with bubble wrap, socks or other similar items to prevent breakage. Not only does this allow you to use fewer boxes during your move, but it also helps ensure the integrity of your belongings, from start to finish. When you take apart a bed frame or similar item, use sandwich bags to corral the tiny pieces of hardware the process produces. Seal and label each sandwich bag, and tape it to the item to keep items organized and clear. This helps ensure you’ll never be looking for the screws you need when you arrive at your new home. If you’re facing a DIY move, you’ve got a lot of “do it yourself” ahead of you. While this doesn’t have to be a bad thing, it should be taken into account as you prepare for your move. 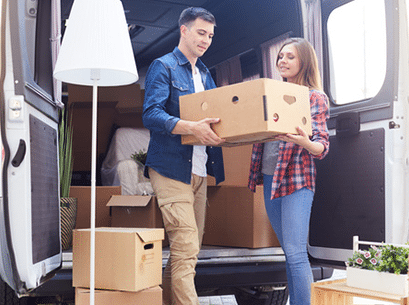 Having a few trusty DIY moving tricks in your back pocket will go a long way toward ensuring your move is streamlined and smooth, and that you don’t run into any troublesome issues during the process. To learn more about DIY moves, get helpful do it yourself moving tips, or talk to our team of moving professionals about how our traceable moving cubes can help make things easier, contact Move it Cube it today. The leader in long distance moving, we’re here to help you throughout your entire process, from start to finish.